Guelph Facial Plastics is proud to announce the two newest devices to our clinic: Syneron Candela’s eTwo and Profound. Providing our patients with advanced treatments and exceptional care is our number one priority at Guelph Facial Plastics. With the addition of the advanced eTwo and Profound devices, our top cosmetic and reconstructive facial surgeon Dr. Matthew Brace and his team will be able to do just that. eTwo hosts two unique applications: Sublime and Sublative. Although they differ slightly, both non-invasive treatments work towards a more rejuvenated, more youthful facial complexion. Sublime uses a combination of infrared light and bi-polar radio frequency (RF) to safely and effectively tighten loose skin by stimulating natural collagen production. Skin issues such as jowls, turkey neck, drooping eyelids and general loose skin around the face and neck can be painlessly and naturally corrected. With little-to-no downtime, this treatment is an amazing alternative to reconstructive surgery. Sublative utilizes only the power of fractionated bi-polar RF energy to resurface textured or uneven skin by stimulating both collagen and elastin production within the upper dermis. Also non invasive, this treatment causes minimal epidermal disruption and requires virtually no downtime. Textural issues such as scarring, wrinkles, fine lines, large pores and stretch marks can be effectively erased through the increase of natural collagen and elastin. Extremely effective treatments on their own, and even better when combined, Sublative and Sublime deliver the ultimate facial rejuvenation. The number of necessary sessions will vary depending on the skin issue(s) being treated; however, most patients can achieve optimal results in as little as three sessions spaced four to six weeks apart. With quick treatment times (about 20 to 40 minutes), Sublative and Sublime are considered “lunchtime” procedures. Since both treatments correct skin beneath the surface, results will become increasingly more evident as this skin rises to the epidermis. Profound is clinically proven to recreate skins essential building blocks: elastin, collagen and hyaluronic acid. As we age, our skin gradually stops producing these vital skin elements, creating signs of aging such as wrinkles, fine lines, and sagging skin. Profound is the first device with temperature controlled RF energy that is clinically proven to reverse these signs of ageing through the stimulation of neocollagenesis (collagen), neo-elastogenesis (elastin) and hyaluronic acid deposition in skins deep dermal layer. As an added bonus, Profound now also includes fractional RF energy which targets the subcutaneous (fat) layer beneath the skin. With this energy, this layer of fat that is situated directly below the dermis can be safely and noninvasively treated, without causing disruption to the epidermis. Being able to treat skin tissue that deep below the surface is truly remarkable for a non-invasive device. 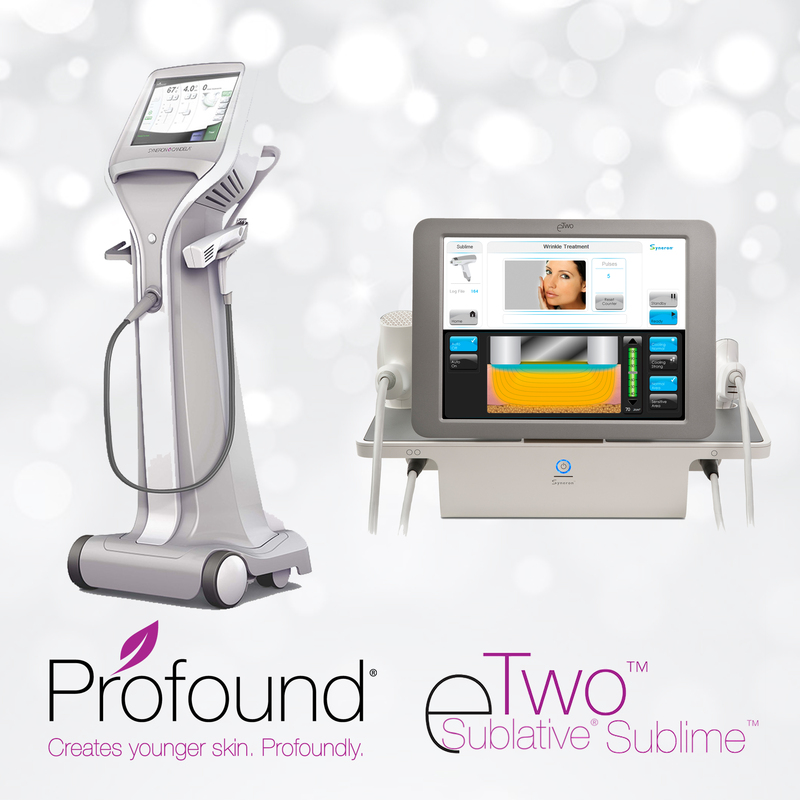 Profound provides more substantial results and requires more downtime than our eTwo treatments (Sublime and Sublative). Uses non-ablative RF to elevate areas of the face that are sagging due to loss of volume. This includes areas such as the brow, cheek, eyes, jowls and neck. Uses this same RF energy to tighten the drooping skin along the chin and jawline, creating what is often referred to as turkey neck. Helps to correct an uneven skin tone by the naturally plumping skin from the inside out. The effects of textural issues such as cellulite can be reduced long-term with Profound Smooth. Is able to get the skin to regenerate it’s natural production of collagen, elastin and hyaluronic acid, essentially rejuvenating itself after just one treatment. After only one of these Profound treatments skin will appear more lifted, contoured, firm and smooth, creating a naturally more youthful appearance. Similar to both the Sublime and Sublative treatments offered with eTwo, Profound’s results are gradual as the treated skin needs time to rise to the epidermal level. Results can be seen in as little as two weeks, with maximum effects visible at six to nine months post-treatment. Patients should expect about three to seven days of downtime following a Profound treatment, during which skin will be swollen, red and slightly bruised. After this brief period of recovery skin will continue to become noticeably more rejuvenated as the weeks roll on. A second treatment is not recommended until at least nine to 12 months have passed. With a 100 percent response rate in its clinical study, Profound is proven to be an effective alternative to invasive measures such as dermal fillers or surgery. Our repertoire of services is about to significantly expand with these two advanced devices. To learn more about Syneron Candela’s eTwo or Profound, contact our team today.